Sign-on for Dry Season - 2019. Sign-on for Team & Court Officials. If you are a registered player you do not need to sign up here. This is for non-playing officials who are courtside. Coaches, umpires, trainers. For 2019, our fees will be largely unchanged from 2018. As we are playing in two associations, the fees differ somewhat between them. For those playing in two associations you are required to pay the Association fee for both Associations, however there will be a reduction of the insurance component as this only needs to be paid once, but there are some extra costs due to umpire payments which are only covered once in the original club fee. When registering, there will also be a Family Levy of $20 per family. This levy is refundable if you assist the club by volunteering as coach, team manager, committee member etc. The aim is to spread the volunteer load amongst our members. Should you have any questions regarding the fee structure please contact us. In addition, to registration fees, please note that Darwin Netball charges gate fees for both Players and Spectators. Breakdown of fees is below. Senior Comp – must be paid PRIOR to Season start. 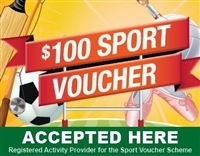 Please note that Sports Vouchers are no longer delivered to schools for distribution. To claim your Sports Voucher please click on the link below. When you get to the payment page, there is unfortunately nowhere to mention that you intend to use Sports Vouchers as part payment. This is a problem with the software and won't be fixed until later this year. We are accepting the vouchers. To use them, just deduct the amount of vouchers you have available from the total invoice and then do a part payment for the balance. We will see the short payment and follow up with you for the vouchers. Vouchers can be handed in to any of the committee, including Kim Schofield at Mackillop College. Registration for Mash Netball Club will be a two part process due to requirements by Netball Australia, Netball NT and the Association's that all players must register on the MyNetball site. The downside to this requirement is that the MyNetball site is not as functional as our current registration system. To register with Mash Netball you will now register and pay through our website. Upon completion you will be forwarded to the Mash MyNetball registration page. From here you can search under your name, which if you have played Netball previously should come up. Select your name and DOB and then follow the Registration details on My Netball. If you have not played before then you will be prompted to register as a new player. You do not need to pay anything from within the MyNetball site, all your fees will have been paid from the Mash website, Mash will forward all payments to the relevant bodies. Online registration, now requires the Primary Contact to be over the age of 18. Primary Contact is entered first and then Players can be added to the registration, creating a family group. Players are able to have their own contact information (mobile phone and email addresses) so as a club we can still contact the player directly where authorised. Once all players and Emergency Contacts have been entered, you will be taken to our online shop to add dresses or other items as required, then to checkout where you have a few options in terms of paying. Vouchers are still being accepted, however there is no method at this point to count these, so if you intend on using vouchers, you can deduct the voucher amounts from your payments and we will follow up with you to obtain the vouchers. Should you have any problems or questions, please email David (treasurer@mashnetball.com) and he will contact you with an answer.